A unique gift that shows you care about the planet as well as the person to whom you are giving. We deliver in Winnipeg for $10. Delivery date to be arranged when order placed, some restrictions apply. You name the price, starting at $50. Leave it to us to create a variety to indulge that special friend, family member or business associate, or make special requests from our shopping cart items. We can include an assortment of fresh seasonal fruits (types that can be eaten from hand), or you can specify non-perishables only. 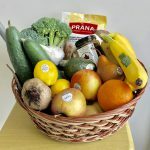 Delivery is free for Fresh Option clients if delivered with their order on the regular route, or a $10 delivery fee will be charged if you would like to have a basket delivered directly to the recipient. To order: Click below on the appropriate value gift basket to add to your shopping cart, or contact us by email or phone (204) 772-1479. Let us know how much you want to spend, the name of the recipient and the address to deliver it to. A time will be confirmed for drop off, and payment arranged. If you live out of province, but want to send a gift basket to friends, family or customers/business associates in Winnipeg…drop us a line!!! 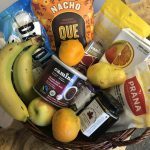 – To communicate any requests for basket contents: food restrictions (vegan, allergies, non-perishable only or if can we include fresh fruit)?